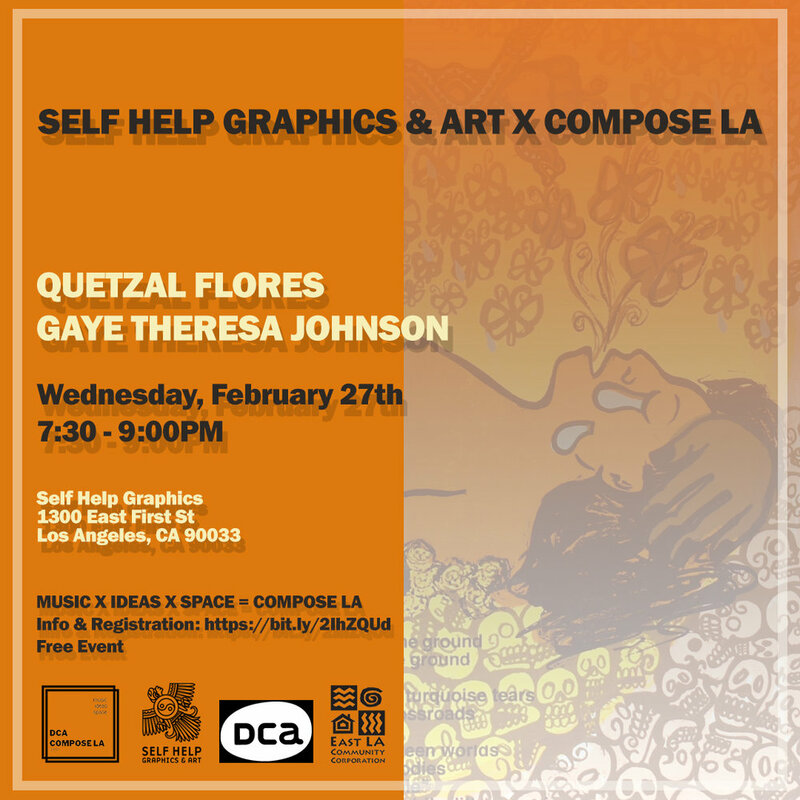 Speaker: Gaye Theresa Johnson, Ph.D.
Self Help Graphics & Art is proud to present this special Compose LA event that will be a multimedia, participatory experience that includes a collective songwriting exercise and an exhibition of SHG serigraphs curated by Quetzal and UCLA professor and author Gaye Theresa Johnson. Their dialogue will unpack the ways music and visual art address issues of race, space, and inequity in communities of color. The audience, which we anticipate will include participants from the Eastside and all over Los Angeles, will compose a musical piece using a pedagogy created by Martha Gonzalez with Quetzal. Flores' practice portrays how music, culture, and social activism combine to build community and music in settings varying from intimate audiences to corporate team structures. Quetzal is one of LA’s leading bi-lingual bands based in East Los Angeles comprised of highly talented musicians who joined for the goal of creating good music that tells the social, cultural, political, and musical stories of people in struggle. The band was founded by Grammy Award-winning composer Quetzal Flores, Director of Arts and Culture for East LA Community Corporation, with the intention of pushing the boundaries of Chicano music. Gaye Theresa Johnson is Associate Professor of Chicana and Chicano Studies and African American Studies at UCLA. She writes and teaches about race, freedom struggles, cultural history, spatial politics, and political economy. Her first book, Spaces of Conflict, Sounds of Solidarity: Music, Race, and Spatial Entitlement in Los Angeles(University of California Press) is a history of civil rights and spatial struggles among Brown and Black freedom seekers and cultural workers in LA. This event was planned in collaboration with Self Help Graphics. Compose LA is a new city-wide new music, new ideas festival planned in conjunction with Department of Cultural Affairs – City of Los Angeles, American Composers Forum of Los Angeles, University of California Humanities Research Institute, and the Center for Music Innovation – UCLA Herb Alpert School of Music. For information about the full roster of events, go to the DCA website: https://culturela.org/programs-and-initiatives/compose-la-2019/.